When planning for the holidays it is important to pick out what is most important to you about the holiday season. Is it a church service, traveling to see family, a delicious meal or sharing a fun experience with people you love? 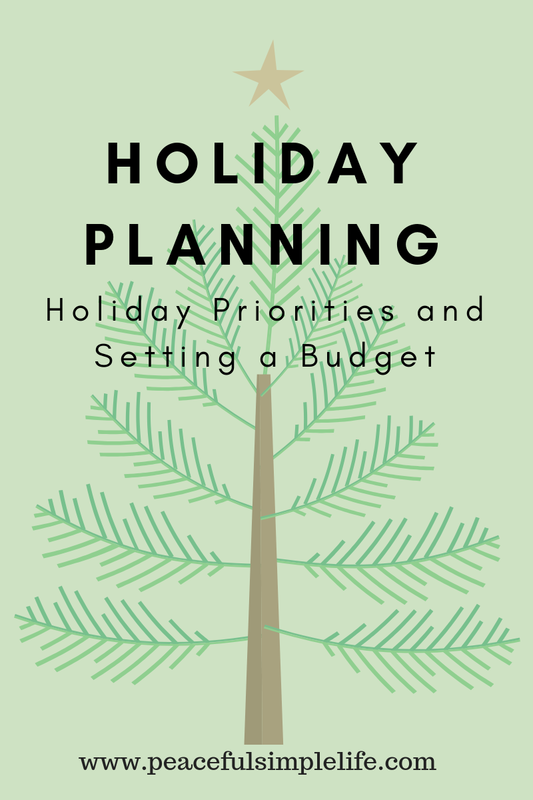 It is easier to properly budget for your holiday season if you can identify what makes the holiday special for you and your family. In our house our first priority is celebrating the birth of Jesus. Our next priority is spending time with family. We also like to send out Christmas cards to our loved ones. When we can afford it, we pay for professional photos to use for our cards. Our last priority is gifts. We love to give the children in our life gifts at this time of year. We don't like to make gifts the focus of the season, but it is fun part of the holiday. We don't need to spend any money celebrating the birth of Jesus, so we start our budget planning with our desire to spend time with family. My family lives nearby. My husband's family, however, lives hours away. If we plan to travel to see them we have to budget for gasoline and a kennel stay for our pup. If my in-laws come to our house we have to budget for the meals we need to make. When planning our Christmas cards I budget for our photography fee, the actual Christmas card, and the stamps to send them. Gifts are the last thing that I budget for. I truly try to keep things simple in my house. Santa brings each child one toy and one gift to share. He also brings a few items for their stocking, but they are often practical (toothbrushes and socks). This year my Hubby and I are giving our kids a family trip to the city in January. We plan to take them swimming and to the science center. We also got them each a book and a sweater so that they have something to open on Christmas morning. I set a dollar limit for our spending and I stick within it. I watch for sales and do price comparisons so that I get the best deal. I also set spending limits on the other little people in our life. The rest of our gifts are homemade. The kids make the grandparents a gift (with help from us) and our oldest helps bake for the uncles. My best suggestion is to start saving for the holidays in January. If this isn't possible then start saving when you can. No one wants you to put yourself into debt just so you can give them a nice gift or meal. It isn't worth it. The best parts of the holiday season are free so set your focus there. Be honest with your family and friends and cut back on your holiday spending. Having a plan in place can help you focus your money where it matters and resist spending in places where it doesn't.